Pine pollen adjusts the functions of the gastrointestinal tract based on its natural and nutrient properties - in particular it has special curative effect on gastrointestinal functional turbulence. Pine pollen is rich in vitamin B1, i.e. thiamin, the main component of decarboxylase coenzyme which is a kind of important substance for adjusting carbohydrate metabolism. Vitamin B1 can promote peristalsis, enhance digestive function, normalize the secretion of gastric juices and activate intestine function. It can also alleviate intractable diarrhea, enteritis and coliform infections caused by the free propagation of the dangerous enteric pathogenic bacteria and microbes without affecting the normal enteric bacteria. Pine pollen can annihilate deleterious microbes or make them dormant so as to be helpful ofr the rapid propagation of wholesome microbes. Therefore, amazing results will occur after the first few days of taking pine pollen in normal diet, thus pine pollen is called as " the enteric guard"
Those taking pine pollen have an obvious feeling that their appetite is increased. Pine Pollen cannot only increase appetite, but also promote food digestion and absorption by the digestive system, and enhance the function of the digestive system. French pine pollen expert, A. Kaya said, "pine pollen can make scraggy patients become stronger when other therapeutics are shown to be non-effective. However, there is no need for overweight people eating pine pollen to worry, as this won't make them gain weight." It was also proved by clinical studies that the figures of those taking pine pollen were adjusted and their waistline reduced greatly, and such effect is consistent to the " losing weight after long-time use" recorded in Chinese medical literature. With the H7N9 avian influenza dominating local news headlines, there is growing concern, especially amongst frequent flyers, on how this new virus would impact on their health. Fortunately, there is confirmation that there is, at least up to today, no human-to-human transmission of this new strain. 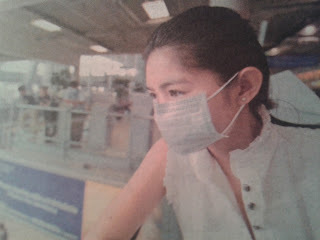 The close interaction with a large number of other passengers in the confines of an aircraft cabin naturally multiplies the chance of infection for the frequent traveler. One is justifiably worried that the circulation of recycled air is an incubator for disease. But with modern technology at work, the situation is not as bad as one might imagine. According to a spokesperson for the Euro plane manufacturer Airbus, the bulk of the cabin air comprises fresh air sourced from outside, and only a portion of the air inside a plane is recirculated, having passed through High Efficiency Particulate Air (HEPA) filters which remove bacteria, viruses and dust particles. As cabin air is circulated vertically around each row of seats, and then extracted through under-seat floor vents, it cannot move backward or forward at will. Therefore, the probability of virus transfer beyond a seat row is almost zero. Aviation experts emphasize that in the wake of the SARS epidemic in 2003, the new generation of aircrafts has devoted extra attention to air purification. The Boeing 787 Dreamliner, for example, has the best-filtered air in the aviation industry. Anyhow, it is recommended that a bit of homework on the destinations for travelers prior to the journey is mandatory. They should also be alert to public health messages through the mass media and government websites. However, many minor ailments are self-treatable, the travelers should consult their family doctor for a list of recommended vaccines and medications before commencing their trips, especially if they are likely to be extended ones. A trip to the local pharmacy to make up a travel medical kit would also be most useful. "Remember: If you have the right medication with you, you can feel better in a matter of minutes, instead of days." The liver is the biggest organ for detoxification. Diet regulation and reasonable nutrients are important to take good care of the liver. Pine pollen's protection effect on the liver is reflected in many aspects: monosaccharide helps to synthesize hepatic glycogens, incretions and enzymes have positive effects on protein synthesis and metabolism. Proteins are decomposed to amino acid, 20% of which will come into blood directly for tissue needs, and most will stay in the liver to be re-synthesized. If hepatic protein is insufficient, fat is stored in the liver and then becomes hepatic lipidosis and then hepatic cirrhosis. Pine pollen is rich in proteins and amino acid. Furthermore, vitamin B and microelements such as copper, zinc and magnesium etc. in pine pollen participate in forming many hepatic enzymes, and have an effect on activation enzymes, then promotes the regeneration and restoration of hepatic cells and promotes the secretion of bile. Therefore, pine pollen is the best nutrient for taking good care of the liver. Pine Pollen contains nutrient materials necessary for beauty, such as protein and amino acid necessary for the body, ferro indispensable to anemia prevention, vitamin A, C and E, carotene, phospholipids and skin care components like nucleic acid which is able to maintain youth. AS proved by medical studies, the essence of beauty lies in the balance of nutrients in the body. Eating more food rich in vitamin C can slow down or obstruct synthesis of melanin. For examples, eating more food rich in vitamin A is fundamental to treating acne and pimple. The lack of vitamin B1 and B2 will lead to facial edema, blistering, itch and angulus oris ulceration. In case of lacking protein and fat, the skin will become rough and grey. Vitamin E has the function of expanding peripheral blood vessels. Combination of vitamin E and A will improve blood circulation, and facilitate the supply of nourishment and oxygen to the skin, bringing a better beauty effect. Thus the lack of some nutriments will have some negative impacts on the face. Beauty must give priority to the diet adjustment and the balance of nutriments. Rich nutriments in pollen are able to nourish and regulate the body from inside to outside, creating the miracle of beauty. The processing technology of pine pollen cosmetics is valued by patent agencies of many countries. In the 1950's, the patent of pine pollen cosmetics has been announced in France, and in the 1970's Japan has declared a series of three patents on pine pollen cosmetics. Pine pollen is called the source of beauty, the food of God and the origin of youth and health. Diabetes is a disorder of carbohydrate metabolism, which is a chronic progressive endocrinopathy featuring an increased level of blood sugar. This is due to either an absolute or relative lack of insulin. According to the survey by the WHO, diabetes, cancer and coropotassium may disable the transformation of fat and protein into energy and the body does not have enough energy to maintain body temperature, with body temperature lowering unconsciously and thus causing coma and even endangering life. Pine Pollen is rich in potassium, with the content of 128.3 mg potassium per 100 gm. Taking pine pollen can provide enough potassium and thus prevent the occurrence of complicating diseases of diabetes and is conducive to the recovery of diabetes patients. So far, researches have proved that taking pine pollen is a safe and effective dietary treatment. It is noticeable that original medicine treatment should not be stopped at the beginning of taking pine pollen. Under the guidance of doctors, patients should gradually reduce medicine-taking amount as they take pollen. The following information is an abstract from Stephen Harrod Buhner, of book "The Natural Testosterone Plan: For Sexual Health and Energy"
Common Names: Different species of pine trees have different common names: Scots or Scotch pine (Pinus sylvestris), black pine (Pinus nigra), Korean pine (Pinus koraiensis), masson pine (Pinus massonia), and Chinese pine, also known as Chinese oil pine and Chinese red pine (Pinus tabulaeformis). Pine pollen is also called songhuanfen (Chinese), songhwaju (Korean), and pollen pini (Latin). Note: A number of sources and Web sites translate pollen pini as “bee pollen” and sell bee pollen as pollen pini. This is incorrect. When looking for pine pollen, care must be taken that what is labeled as pollen pini really is pine pollen and not bee pollen. Parts Used: All parts of the pine are used for medicine, including the pollen, bark, seeds, and needles. To increase testosterone in the body and balance the androgen/estrogen ratio, the pollen is the primary part used. It is very high in testosterone. To a lesser extent, the seeds may also be used for this purpose, with some caveats (see chapter 6). Although the bark is excellent for many things, it normally does not contain enough testosterone and other androgens to be of use for this purpose. As pine pollen tablets can improve the testosterone level, it is commonly used by people for absorbing more nutrients together. If you would like to know more and how it can help, please visit our site at www.pinepollen.hk or link it here. Pine Pollen is rich in functional substances (inclusive of protein, vitamin, micro element, flavone compounds, etc. ), which act on the body in synergy to regulated varios functions of the body, balance nutrients of the body, strengthen metabolism, and prevent permeability malfunction of capillary vessels. Pine Pollen can also promote the growth of endocrine glands and enhance and regulate the secretion function of the glands, thus it is above to treat diseases caused by endocrine dysfunction. The growth of prostate and physiological maintenance depends on enough male hormones, especially the balance of male and female hormones. The pathogenesis of prostatic hyperplasia is related to the disorder of the endocrine system's regulation and control functions. Pine Pollen contains more than 20 types of amino acid such as glutamic acid and proline, which are able to improve flood circulation caused by prostatic hyperplasia. Flavone-like substance in the pine pollen has a strong anti-oxidation function, thus inhibits prostatic hyperplasia. In addition, according to the result revealed by a latest research, prostaglandin (PG)E1 plays a significant role in regulating the function of T cells, especially enhancing resistance to cancers. The production of PG E1 is dependent on dietetic factors, inclusive of linoleic acid, linolenic acid, zinc, vitamin B6 and C. The lack of any nutrient elements will result in the reduced content of PG E1, thus dysfunction of T cells. All of the above mentioned active materials can be found in Pine Pollen. Although we do not yet know the mode of transmission, it is prudent to follow basic hygienic practices, food preparation, etc. To strengthen body mechanism is vital to keep away from such virus. Please join us at twitter for more information and current news from WHO starting from April 3.